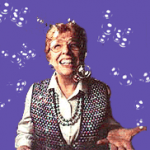 Across the Fence: Dorothy Wilhelm tells Sound history - Here's...Dorothy! If you feel that you have heard all of Puget Sound history and nothing could surprise you anymore – think again! For the other day, I finished reading legendary author and humorist Dorothy Wilhelm’s latest book, “True Tales of Puget Sound”. And I just wish history in school were taught as lively and interspersed with fun facts as this beautiful book manages to do. Dorothy Wilhelm has a gift for turning history into an experience which brings the past right to your doorstep. As many of you might know, Dorothy Wilhelm used to be the TV show host and producer of “My Home Town”, and as such she traveled the Puget Sound region, digging into what defines all kinds of smaller and bigger communities. At the fringe of these productions, local residents told Dorothy Wilhelm bits of history that are not mentioned in your everyday history book. History that they or their family experienced from the times of the first settlements up to the presence. Now, everybody who knows my friend Dorothy also knows that she is very inquisitive, constantly checking out things across the fence, and wants her facts straight. So, she started checking on what she had heard and backing up these tales by countless interviews with historians and reading numerous books (the bibliography is quite impressive). The result is an amazing book about what I call “lived” history (in contrast to names-and-numbers-noting history). There are stories about the incredible generosity of the first settlers against newcomers, about the hardships of pioneer days that, here in Western Washington, don’t reach too far back, about the big picture as well as small items. Dorothy Wilhelm links up seemingly unconnected topics with astonishing ease. Or would you know e.g. how a cookbook is of importance to woman’s voting rights? And with that typical humorous glint in her eyes, she manages to remind us of how we would deal with situations of the past today – or rather quit, because – let’s face it – we have become pretty soft. Most of us would stop after the first few miles of the Oregon Trail and return home with blisters on our feet and complaints about the weather. Well, Dorothy Wilhelm has that gift to point out such things without sounding reprimanding. 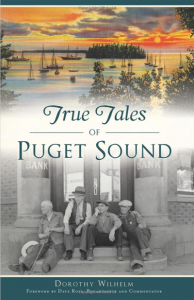 “True Tales of Puget Sound” presents us with some marvelous stories of 20 Puget Sound communities. And a fantastic compilation of old photos and artwork illustrates the text and makes the book a true work of entertainment as well as of local history. Dorothy Wilhelm’s “True Tales of Puget Sound” is available as a hardcover and as a softcover (210 pages each) anywhere books are sold. Or you might want to check out one of the author’s book signings to get yourself a signed copy. An ebook version is also available.